This is a review of the V-force weight vest. It’s really compact and it secures easily with a claps in front. The vest that will work perfectly for anyone wanting to add resistance to their training. The 40 lb V-Force Weight Vest is a much superior option available in comparison to other vests available because of its high quality. Body and shoulder padding is available in a single and double layer having a density of about 7/16’. This vest is crush proof and mildew resistant. Additionally, it has ozone protected foam. The body form of the vest is maintained through Inter-Skeletal webbing reinforced pockets and shoulders. The vest is made using Cordura materials. This material offers abrasion resistance. Cordura is perfect for military and sports gear. You also get a sweat stopper liner with this vest. The best thing about this liner is that it can easily be washed in the washing machine. There are other optional items that you get along with this vest. They include night reflection bands and hydration pack. The night reflection bands are quite useful when used for visibility in a low light condition. This vest is available with all the weights included. Short on Time ? >> See the best price for the V Force Weighted Vest on Amazon here. The weights are 2.5 lbs each and fit snug on the front pockets that are triple layered to keep the weights in place. One feature I love about the v-force is that it comes in 2 models. One for people with narrow shoulders and another one with wide shoulders. This is a big difference form most vests as they are almost always one size fits all. By now you might be excited to know more about this weight vest so we will just explore it in detail. With over 30 years of designing weight vests, this is a brand you can trust. In a Hurry to see more ? Check out the best price on amazon here. The Military look and feel of this vest give it a unique style. It provides the ultimate weight support during exercises due to the triple layer pocket backing. This vest is designed in a way that it can last a lifetime. The reason is that this weight vest is designed from quality materials that will just not wear off easily. It comes with adjustable straps and reinforced pockets. At times it becomes hard to trust a product, but it will not be the case when you opt for this vest. The reason is that VForce enjoys an experience of 30 years in designing weight vests. You can easily make use of this vest when indulging in heavy plyometrics, stair climbing and walking as well. The weights are about 2” wide, 3-7/8” long and 1-1/2” thick with rounded edges and corners to prevent the pockets from wearing off. Each individual weight weighs 2.5 lbs. Now I do want to mention that military personnel use this to help simulate armor and ruck sack to help them get ready for training. There are some additional features as well mentioned below. Now you need to have a clear idea about the sizing as well so that you can get hold of the right sized vest. 40lb V-Force Weight Vest is available in two different sizes. One size is 3-1/4” – narrow shoulders. The other size is 4-1/4”- wide shoulders. You should select the size depending on what best suits your needs. You should go for wide shoulder vest if you indulge in running exercises. If you are more inclined towards body-weight workouts, then you should go with the narrow shoulder size. Now you need to know the benefits of this vest before deciding to opt for it so here are the details. It is a secure purchase. The reason is that the manufacturer offers you a guarantee of a lifetime. Plus, they offer a 30-day money back guarantee as well. This means that if you are not satisfied with the vest, you can get your money back. This vest offers the perfect fulcrum effect. It works great when you have to target the core muscles. The best thing about this vest is that it feels secure. You will not feel the weights or vest flopping around while running. The chest and the shoulders are narrow so the vest does not interfere when doing upper body exercises. This vest is perfect for crunches, burpees, pull-ups, push-ups and running. The vest is perfectly padded so you will not feel that anything is sticking to your chest during the workout. Last, but not the least the camouflage of the vest gives an intimidating and powerful look. The other major quality about this vest is that it truly has a solid construction. Backed by a manufacture who has designed vests for 30 years! You might be wondering what the maximum weight capacity of this vest is, and the answer is that this vest can have 60 lb max though originally this vest is designed for 40 lb weights. There are other models that v force makes which can go up to 150 lbs. So, if the 40lb vest is not what you want you can go lower or higher in weight. Which is another reason why I really like the v-force vest. Well, when I read the reviews about this vest then I was pretty confident about the fact that it is the right purchase. This vest received a lot of praise for the fact that it is comfortable and secure. The design is also quite appealing to the eyes. There is one more reason that this vest has gained a lot of attention. Most customers feel that the stitching of this vest is quite perfect and lives up to the high-quality standard promised by the manufacturers. Most people feel that this vest is truly worth the cost and is a worthwhile investment. Another quality about the vest that has been pretty appreciated is that it can easily be adjusted. Most customers feel that this vest is a worthy choice because the weights are adjustable as well. Obviously, the room for improvement is always there, so I did come across a few drawbacks. However, they can be improved because they are just minor issues. Some customers feel that the sweat liner tends to rub against the neck causing irritation. Some feel that the Velcro belt is a bit too long. The manufacturers should try to improve these slight flaws of this vest, and I believe this will boost the sales further. If you are serious about your workout sessions, then you should not miss out on the 40 lb V-Force Weight Vest. It has the best features, and the number of pros truly exceeds the cons. This is why you should get your hands on this vest at the earliest. 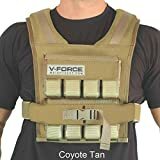 You can get the best discounted price for the V-force on amazon here if you are looking to buy a vest that will last, is comfortable and won’t get in your way during your workouts. It’s built to last and take the punishment! It is pricer than the others but in this case you get what you pay for. This could be out of your price range for some of you. Feel free to head over to our weighted vest review guide here to see other options if that is the case.